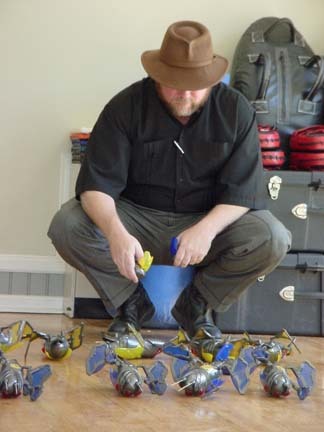 Mark Tilden is the designer of the BIOBUGS robotic toy, as well as the ROBOSAPIEN and others, manufactured by HASBRO/Wowwee Toys in 2001. 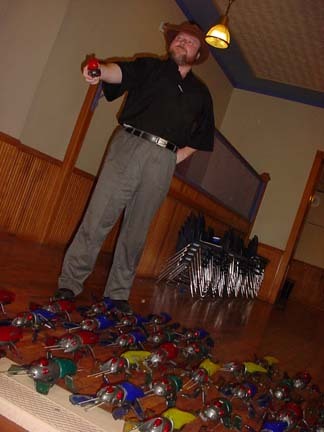 He managed to have several hundred sent to the Telluride 2003 Neuromorphic Robotics Workshop, where they were used in these experiments on group behavior and patterns of social formation, and were then distributed to participants and used for spare parts. There are four types of BIOBUGS, each type indicated by a different color: Blue, Red, Green, Yellow. The internal controls of each type are identical, but they differ in structure, and thus in performance and behavior. The main difference is the legs, which have a different shape and slightly different angle of motion in each type. The result is a difference in speed versus climbing ability. The other significant differences are in the InfraRed (IR) sensors and transmitters. Each type transmits its own signal from LEDs on the nose and tail, allowing the robots to "recognize" each other as friend (same type) or foe (different type). These signals are detected by IR-sensors in the eyes, however each type has a slightly different eye placement, meaning some have a wider field of view while others have a narrower field of view but can see objects directly in front of them better. 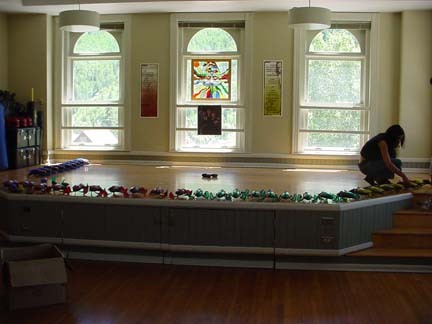 The different types also make different sounds, but this does not affect performance or behavior in any other way. 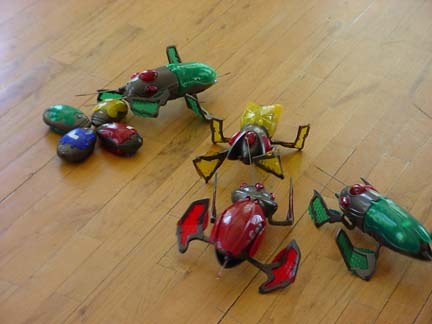 The BIOBUGS are also equiped with antennae sensors (two in front and one in back). The antennae sensors are simple on/off contacts, but when viewed temporally, there are three significant signals. 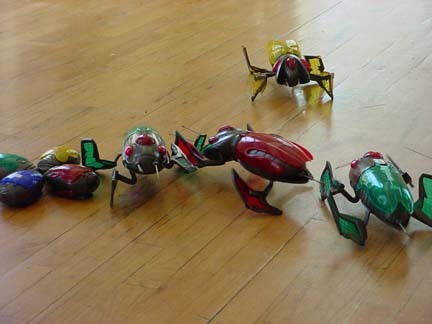 When the robot is walking, the antennae oscillate at a constant rate, indicating nothing around. 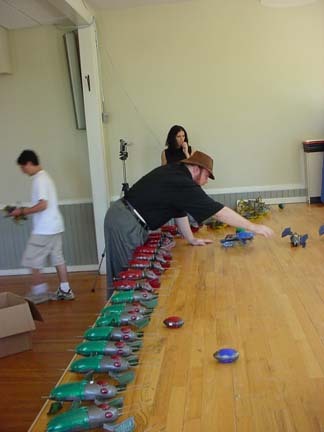 When the robot runs up against an obstacle, the contacts are left in a constant "on" state, thus indicating a static obstacle. When the robot senses neither a steady on/off, nor a constant on, but instead an irregular on/off singal, then the robot interprets this as a dynamic obstacle, i.e. another robot. 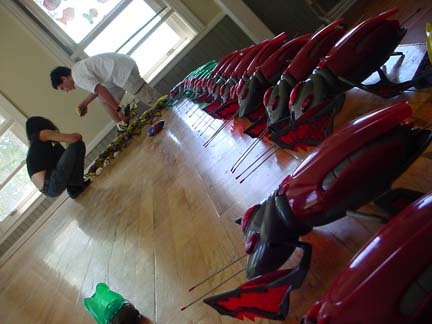 The robots are programmed to enter a "fight" mode when they encounter other robots, in this mode they frantically try to climb on top of each other. 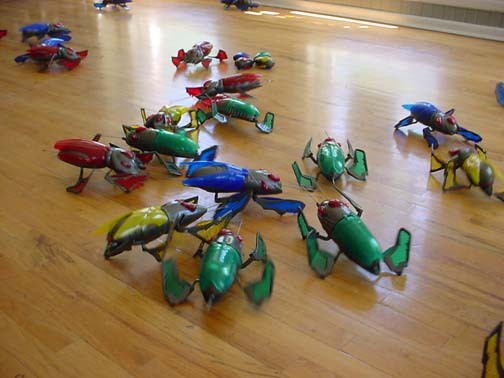 In a fight, the robot that winds up on top "wins" and knows this because its antennae become free of obstruction, while the losing robot has its antenae stepped on for too long and recognizes this as a "loss." Each win or loss alters a "confidence" variable in the robot, which starts at 5 and ranges from 0 to 10. 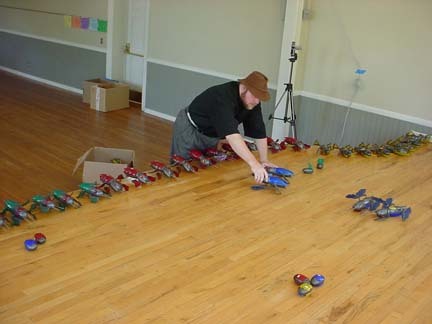 The more confidence the robot has, the more aggressively they will fight. 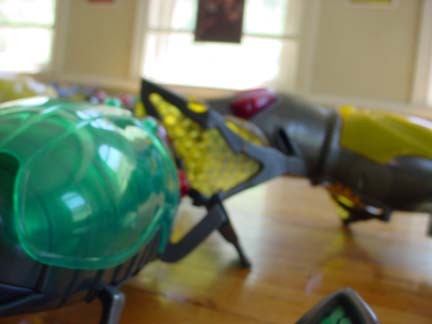 The BIOBUGS come with a remote control unit that can be used as a food target by eminanting a IR "food" signal. All the types are atracted to the food signal equally. 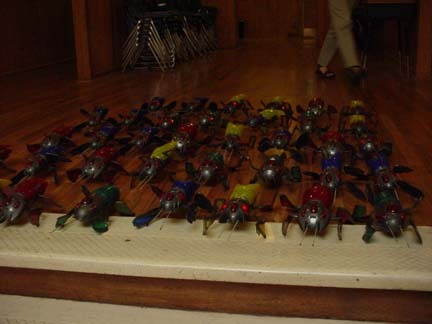 The first step was to test all of the BIOBUGS to be used, to make sure the operated properly, had good batteries, etc. 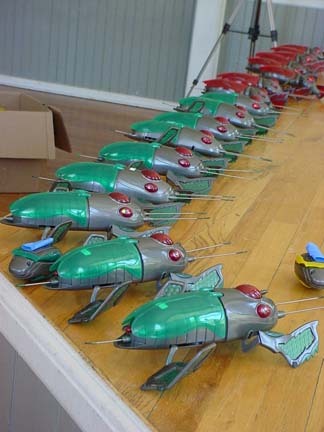 The second step was to "train" them all to be Super-BIOBUGS, that is to say to give them a confidence of 10. 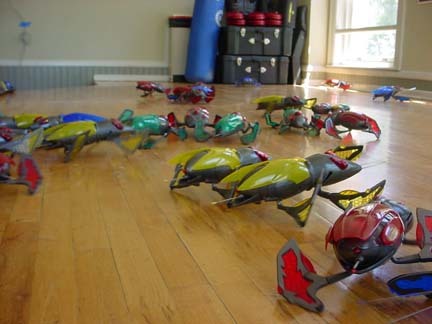 This was done by lying them on their backs, grabbing their antennae to make them think they are in a fight, and then leave them alone to think they have won the fight. 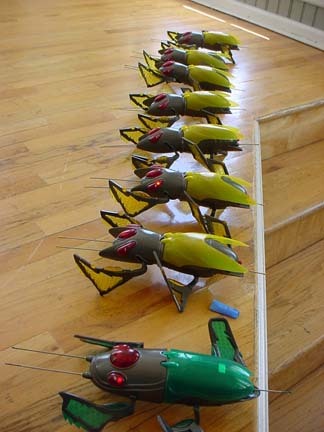 10 Super-BIOBUGS of each type were lined up, and aimed towards three food sources, then released! 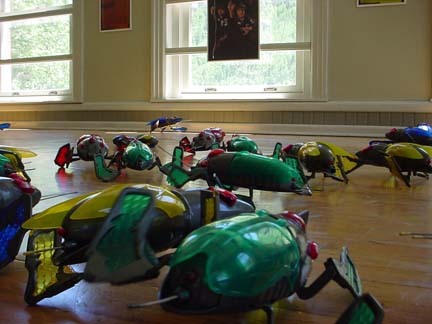 Same idea, but it was much easier to notice the specific character of each type, and the emergence of group behavior, such as apaprent teamwork between the Green BIOBOTS, as one fought to distract enemy robots while the other fed. The two seemingly minor structural differences in leg shape and eye position lead to very different "personalities" for each type. The Green ones are slower, but better climbers, but their wide eyes often lead them to fights and make localizing food difficult. The Red ones are also slower, better climbers, but have narrower vision, and are much better at finding food. The Yellow ones are fast and their narrow vision makes it easier for them to find food and avoid fights. 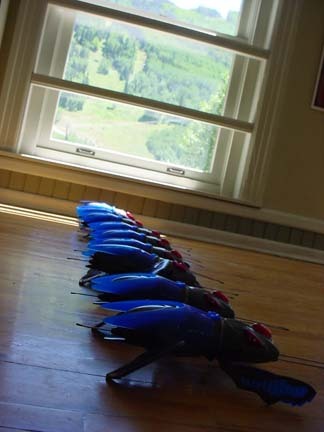 The Blue ones are fast, but their wide vision makes it hard to find food, and leads them to fights and to wander off. Mark decided it would be "Really fun!" 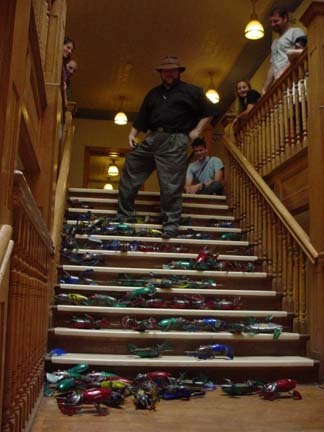 to send a bunch of BIOBOTS marching down the main stairway of the Telluride Colorado Elementary School. So we did it. It was really fun.